Pythagoras was a philosopher and religious leader from Samos, an island off of Greece, (between around 570–495 B.C.E.). He became well-known for his developments in mathematics, astronomy, and music theory. A secret group, the Pythagoreans, was formed in the city of Croton where Pythagoras taught a curricula of four mathemata or studies consisting of arithmetica (number theory), geometria (geometry), astrologia (astronomy), and harmonia (music). 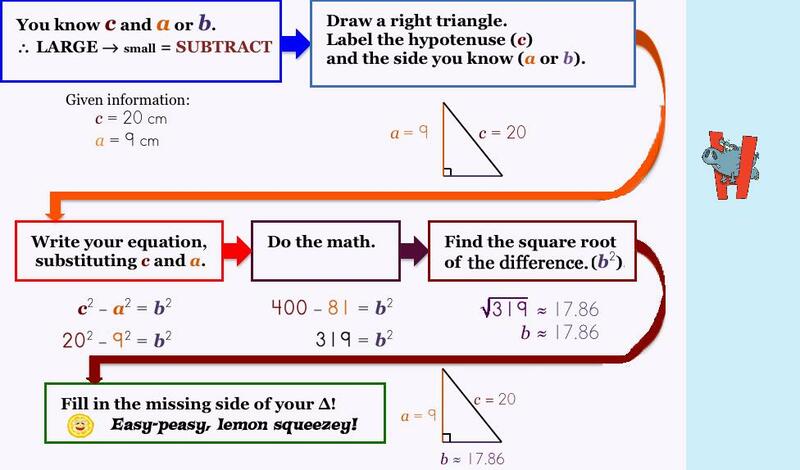 From this secret brotherhood, which believed, "Brotherhood is the greatest purification," we have learned about the Pythagorean Theorem (although it is highly probable and likely that the theorem has been around for much longer. The Pythagoreans, however, provided the first logical proof of the theorem. Each leg is labeled with a letter: a, b, and c. The letters a and b and used for the two legs that make up the right angle and the letter c is used to denote the hypotenuse (the leg opposite the right angle). The important thing is you have to know what to DO with the letters and the numbers when posed with a problem! Yep, that's right! And, guess what…if you understand some of the basics (hint, hint! ), then it really is as easy as it appears! So, let's get started so that you can see what I am talking about! Lots of problems give you the two shorter legs but NOT the hippo, er, the hypotenuse. If that's the case, then this is the flow map (equation) you should use to find your answer! 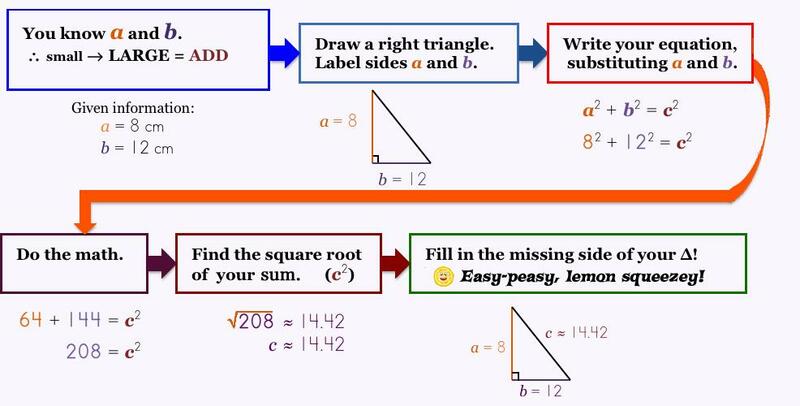 Sometimes, a right triangle problem provides information on the hypotenuse and one leg. This is like a hippo with a broken leg! 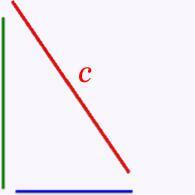 You need to find the measure of the missing or broken leg so use the subtraction equation as shown here.